The break is over! As things have calmed down over here, I'm thrilled to be able to have the time now to get back to my daily posts. I hope you all had a fantastic holiday! Today's post isn't an item in my collection per se, but it's something I definitely wanted to share with you all to let you know that it's out there. For Christmas, I got a plethora of The Good Dinosaur merch (which I'm very excited about, but more on those gifts later) and it was all wrapped in this adorable Good Dino wrapping paper! A huge thanks to my mom. This paper is definitely geared towards the holiday season (with the reds, greens and snowflakes), but there's nothing too overly "Christmasy" about it; So, even though Christmas is over this year, it can definitely be used for other celebrations (such as New Years, birthdays, etc..) this winter! 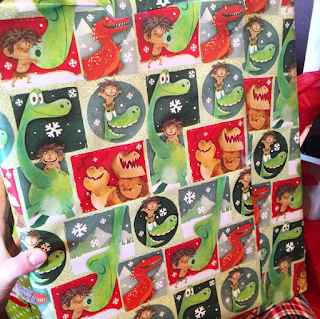 If you're looking to theme up your wrapping paper with your Good Dino gifts, then this is for you. I love the amazingly cute designs of Alro, Spot, Buch, Nash and Ramsey along with the great colors and layout! Be sure to pick up a roll on Amazon using the link below. Highly recommended!